Aiai, Meemee, Baby and Gongon bring their antics to PlayStation Vita. Super Monkey Ball's success still amazes me. The original, released alongside GameCube in 2001, was a quirky, well-designed and super addictive platformer that didn't scream multi-console franchise, yet Sega turned it into one, releasing new Monkey Ball titles on every console/portable since. That said, those banana hungry apes will appear on PlayStation Vita in the upcoming and possible launch game, Super Monkey Ball: Banana Splits. Having played this latest entry, the publisher's on the right track. The game already controls much better than the disastrous Super Monkey Ball 3D, as Vita's left analog stick offers responsive control. With this in mind, you can also play Banana Splits using the built-in gyroscope, and once again, this method is superior to the 3DS game, especially since users don't have to wrestle with the 3D slider to see the action. 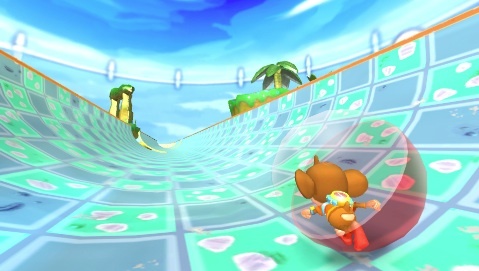 Of course, if you've played one Monkey Ball, you've essentially played them all, with this one being no exception. The goal of rolling a monkey encased within a semi transparent sphere remains the same, picking up scores of yellow bananas along the way. What separates this game from the rest is the inclusion of a promising create-a-stage mode that lets you snap a photo using Vita's built in outward facing camera and then watch as Banana Splits creates a custom level. The technology needs tweaking (Sega admitted as much), but this could be a neat feature, so long as the developers work out the kinks. On top of that, you can also expect a variety of mini games, including Monkey Target, which may feature offline/online multiplayer. 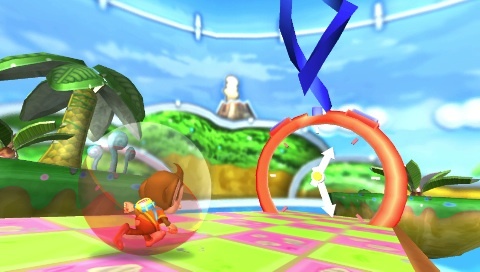 So long as Sega doesn't try anything silly (boss battles, for example), Super Monkey Ball: Banana Splits should be a welcome addition to the PlayStation Vita library. Definitely cross your fingers that it appears during the system's launch.